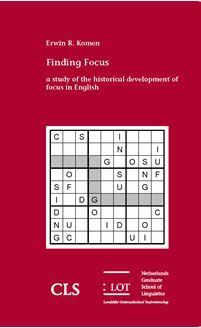 Erwin R . Komen Finding focus a study of the historical development of focus in English This study reveals how two important focus articulations change over time in written English . Constituent focus , often accompanied by contrast , makes use of the clause - initial position in the oldest stages of English , but as this position comes to be used for the grammatical subject over time , the i t - cleft construction is increasingly used for the expression of contrastive focus . There is no one - to - one mapping between contrastive focus and the i t - cleft : the Old English i t - cleft , on a par with modern Scandinavian counterparts , mostly functions as a text - organization device , and a synchronic study of Chechen shows that it uses the i t - cleft exclusively for text - organization , while focus is indicated by word order and wh - clefts . Presentational focus , which is used where the main objective of a sentence is the introduction of a new participant , prefers to have this participant after the finite verb , but the strategy to achieve this goal changes over time : the word order flexibility of Old English allows new major participants to appear as subjects after the finite verb , but the growing demand of having grammatical subjects appear before the finite verb results in the use of an expletive strategy in late Modern English : the expletive is before the finite verb , while the logical subject follows it . The study on the change in focus realizations makes heavy use of texts that are enriched with referential information : the referential status of each noun phrase , and a pointer to an antecedent if a noun phrase is anaphoric . The success in using this information in order to determine focus domains leads to an important hypothesis , which says that focus is compositional in nature : focus articulations can be derived by combining syntactic and referential information . Further work should explore this claim in more detail .